I layout my best available insight about the currency markets on a daily basis. I tried to sound “smart.” Often I tried to convey some sense of prescience I may have about currencies. But I have no “gift of hindsight,” few of us do. I know that. And because I have seen some very strange things happen over the years that have drained more money from my trading account than I care to talk about (or let my wife know about), I do my best to approach markets as a game of probabilities. I think it’s the right way to do it. What I mean by a game of probabilities is this: I do the best I can in my fundamental and technical analysis; I do all I can and try to do it with discipline, focus and consistency. I do this to try to gain an edge. But I know there is never such a thing as certainty; one can never have enough brain power or computing power to harness the mind of the market. It’s not because the computing power isn’t available—it is. It’s because the players in the market do not make “rational” decisions all the time. Economists who believe in things like equilibrium and modeling of cause and effect and the rational man as the cornerstone of economic (price) analysis have had their clocks cleaned. It is why the new thinkers in the field of economics are gravitating increasingly to behavioral economics for help about how the real world really works. Needless to say, we all continue to search for some type of Holy Grail model to forecast price action. But no such Grail seems to exist, or at least those who have found it aren’t sharing. Is there is reason to believe the perfect price model will be found anytime soon? I don’t think so. “If you are going to use probability to model a financial market, you had better use the right kind of probability. Real markets are wild. Their price fluctuations can be hair-raising—far greater and more damaging than the mild variations of orthodox finance,” writes Benoit Mandelbrot, The Misbehavior of Markets. “Real markets are wild.” If you trade for real money, you already know this. 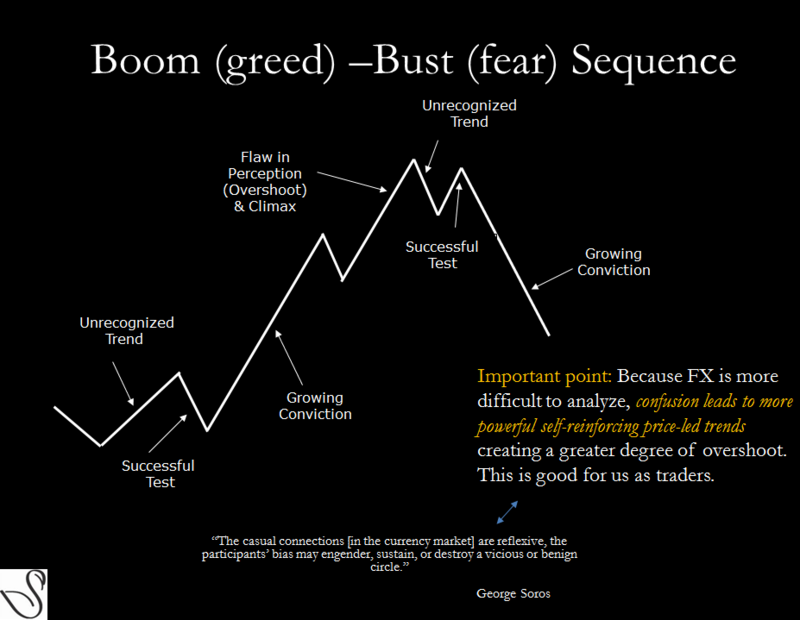 And if you attempt to overlay cause and effect on price action, you know this. So, does this mean we should be defeatist and believe we can never win? Absolutely not! If you attack the market with the mindset that it is a probability game—interspersed with wild and unpredictable movements—that already can give you a substantial leg up on the crowd. As traders, our goal is not to believe we can forecast the next layer of irrational reaction to future news we cannot predict, but it is to develop a system (technical, sentiment, or fundamental driven) that can increase the probability of our success. I believe a probability mindset forces a degree of perspective and discipline that most other players don’t have. The natural benefit of thinking in probabilities is the acceptance you cannot predict with any degree of certainty. This doesn’t mean you don’t forecast. It means when you do it, you know ahead of time how much the right to forecast will cost, i.e. your stop-loss level. Granted, even the process of trying to formulate a probability is subjective. But, keep in mind, in trading you can win many fewer times than you lose and still make money. How? If when you do win, it is that much larger than when you do lose. This is where the probability mindset pays its biggest dividends. It is hard for those who haven’t traded and been dinged psychologically over the years, to understand that losing more than you are winning can be a winning strategy. This is another reason why trading is not easy, and to a large degree unnatural. So, as trite as this sentence may be, and there are many such trite phrases when it comes to trading and investing, I still think it’s worthwhile to keep it tight packed into your short- and long-term memory banks. Whenever I forget it, I get myself into trouble. Your edge, applied with consistency, should allow you to inch the probabilities of a winning trade slightly in your favor; this alone is what will allow you to win overtime. And keep in mind, this trading game in reality is a marathon, whereby you remain open to learn more and more along the way and finish the race stronger than when you started. That is why I use the phrase “over time.” Long-term investment success, even for those of us who trade short-term, is the destination. I have learned much from reading and listening to Mark Douglas. Applying his insights has made me a better trader. Here is a video of Mark Douglas, author of Trading in the Zone, talking about thinking in terms of probabilities. Newer PostA reliable framework for trading currencies? Older PostUS Nonfarm Payrolls. Gross!